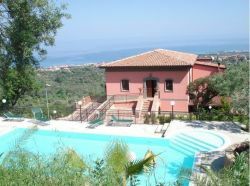 L’edificio che ospita il B & B “maredomus” è un antico manufatto del ‘700 recentemente ristrutturato, sito sul Lungomare Garibaldi nel centro di Milazzo, di fronte al porticciolo turistico e accanto alla storica chiesa di Santa Maria Maggiore. Questa è la via più frequentata della cittadina sia dal punto di vista dello shopping che del “passeggio” serale, su di essa si affacciano edifici storici di grande pregio architettonico, oltre a negozi e a numerosi locali bar e ristoranti. Dalla chiesa di Santa Maria Maggiore inizia l’antico quartiere marinaro di Vaccarella , con le caratteristiche imbarcazioni per la pesca e i banchi per la vendita al dettaglio del pesce. Prospiciente alla fermata dei pullman è anche il porto per l’imbarco per le isole Eolie; il porticciolo turistico, antistante Il B & B, offre l’opportunità di ormeggio per i natanti. Dal B & B sono facilmente raggiungibili a pochi minuti a piedi anche le spiagge per la balneazione, sia a ponente che a levante. Alle spalle del B & B si trova il caratteristico quartiere medioevale del “Borgo” con il castello raggiungibili in 5 minuti a piedi. In estate e nei Week end il “ Borgo Antico” diventa un importante luogo di incontro dove si possono trovare molti pubs, incontrare gente e passare piacevolmente il tempo degustando cibi e ascoltando musica. B&B “Maredomus” is placed in a really ancient building of 8th cent. completely renewed. It is situated on Lungomare Garibaldi in Milazzo’s old town centre (seafront Garibaldi), just in front of a small port and next to the antique Santa Maria Maggiore’s church. Lungomare Garibaldi is the most popular promenade in the old town, good for both shopping and the evening’s “walks”. There are many ancient and famous buildings along the promenade, as well as several shops, restaurants, bars and pubs…The Santa Maria Maggiore’s church leads off to the small old seafaring district called Vaccarella and its folkloristic fishing boats and fish’s stands. 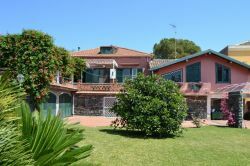 The B&B, thanks to its central position, is easily reachable, as it’s only 400 m far away from the urban and extra-urban bus stops that guarantee connections with the train station and, during summer, with Catania’s airport. Easily reachable is also the Messina-Palermo highway. Nearby the B&B is also the port that assures the connection with the Aeolian Islands. In a few minutes, walking distance, from the B&B are the beaches on the west and the east side. Behind the B&B and only five minutes walking is the medieval district “Borgo Antico” with the old castle. The B & B “maredomus” is easily reachable from the train station and from the highway. It is placed on Lungomare Garibaldi, in the direction of Capo di Milazzo, nearby Santa Maria Maggiore’s church. The B&B “Maredomus” is a really ancient building dating back to 8 cent. At the beginning it was a municipality’s property, now it’s a private building which was completely renewed. The elegant façade dates back to the 1930’s and shows several Art Nouveau items; inside you can see pieces of the original structure matched with a modern style in a very bright and full comforts frame. In the hall, on the ground floor, an old well was discovered, which is now preserved, there are also the ancient stone’s stairs that lead to the first floor. 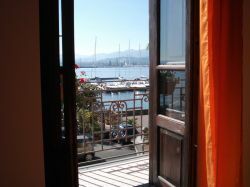 The rooms are placed on the first and second floor, they are really cosy and bright, and the view is amazing as the building looks directly at the sea. The price of the room includes breakfast that you can have in the bar nearby the B&B. We’ll also take care of all comforts you might need. We can also suggest you some short plans for a day-trip to the nearest town and to the Aeolian Island.